There’s less than three days to go until voters cast their ballots in general election 2017 and the polls are changing unusually quickly. This implies either a volatile electorate or issues with survey methodology but, regardless of the explanation, it means that predicting the likely outcome is very tricky. Nevertheless, there’s a number of themes that have emerged throughout the campaign that, depending on the result, will present lessons to be learnt and questions that will need to be asked. Once again we saw that the quality and volume of earned media is disproportionately important in elections. Theresa May avoided the public and spoke at fairly staid, carefully managed events; a tactic that frustrated the journalists that accompanied them on the campaign trail. This fact, combined with lacklustre media performances and a refusal to debate Corbyn, meant that her earned media share was lower and more negative in tone than the Conservatives would have hoped for and her approval rating declined sharply as a result. Corbyn, however, made himself available to the public and spoke at large rallies – which produced better pictures for the media – and his question time performances made him seem much more relevant and affable. The energetic campaign by the Labour Party led to a sense amongst the public that his previous portrayal in the media was unfair and his approval ratings improved as a consequence. If the tightening of the gap between perceptions of the leadership capabilities of Corbyn and May does lead to a closer result than was previously anticipated, the importance of media narrative and management will have once again asserted itself. 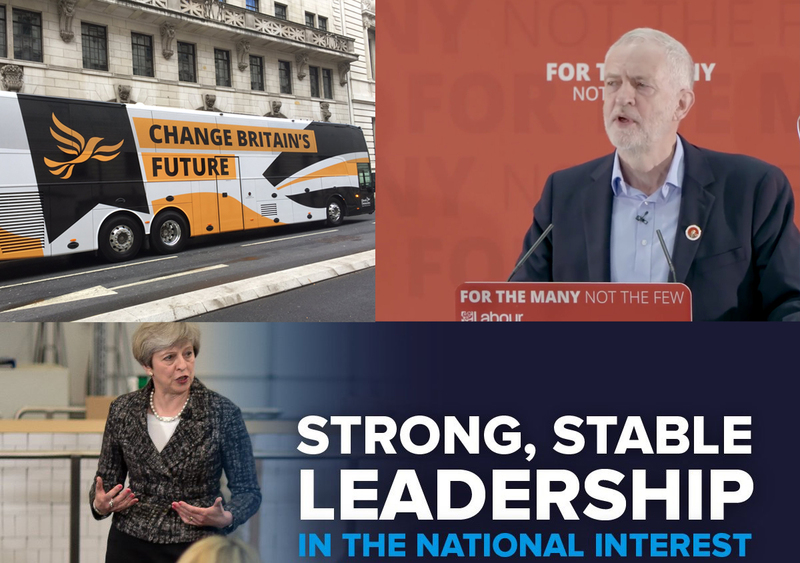 This election has seen the highest volume of advertising – in terms of number of executions – but also the fewest posters (Britain’s traditional political advertising medium) in memory. The advertising contest was almost entirely carried out online and was therefore far more discreet (as well as more measurable and more targeted). Voters using Facebook and YouTube in different areas of the country will have had very different experiences of the campaign; whilst marginal seats have always had more focus from campaigns, usually the advertising was something which everyone ‘saw’ through the national news coverage. No longer. a) Experience; Edmonds Elder, the agency running the Conservative online effort, have run the digital aspect of multiple high profile election and referendum campaigns in recent years. b) Money; available data shows they’ve raised twice as much – around £8 million to Labour’s £4 million. If the Tories perform better than the polls are currently predicting, it will be hard to argue that the Conservative’s impressive advertising operation wasn’t a factor, as nearly every other aspect of their campaign has been sub-optimal. This will have the effect of increasing the importance parties place on fundraising and the amount of investment campaigns direct towards advertising the next time Britain heads to the polls. 3. Do manifestos now matter? There’s huge amounts of research to show that people make decisions about who to vote on an emotional basis and then look for rational policies to back-up their choice. There’s also plenty of research to show that the owner of the policy colours how good voters think it is. i.e. to a Conservative voter in 2017 an energy price cap seems like a very positive initiative for those who are ‘just about managing’, but in 2015 – when it was a Labour Party policy – it was an example of unnecessary interference in the free market. But polling thus far suggests that the major turning point in the campaign was the release of the Labour and Conservative manifestos; one surprisingly well-received and the other filled with bitter medicine that much of the electorate were not willing to swallow. If Labour perform better than expected, some will argue that in a post-Brexit world – where historical ties to parties were further severed – the humble manifesto will become more important in future elections. Early polling showed that a large number of seats that were previously presumed as safe Labour constituencies were up for grabs. If the Conservatives perform well in the midlands, north and Scotland and Labour only really dominate in London, the viability of a party which tries to bridge the interests of the post-industrial north and the liberal elite will again be called into question. The hugely divergent visions and personalities of the two main party leaders, the low likelihood of a hung parliament and the relative weakness of those fronting UKIP and The Lib Dems meant that interest in (and the likely vote share of) third parties declined significantly. This will probably disproportionately favour the Conservatives. What is the road back to influence (and seats) for Britain’s third parties? 6. Can you lose seats and still seem like a winner? Much has been made of the rumour that Labour are pursuing an objective of improving on the national vote share that Miliband achieved in 2015, rather than winning more seats. Such an objective implies a radically different campaign strategy and one that we’ve not seen from one of our two major parties before. In the aftermath of an election result in which Labour’s national vote share increases on 2015, but they face a net loss of seats, there will be discussions as to whether or not it’s legitimate to campaign for anything other than a majority in the House of Commons and whether Corbyn has achieved enough to remain as leader. 7. And finally… can you win more seats and still lose? If Theresa May limps home to victory, only slightly improving on the mandate that David Cameron achieved two years ago – having performed an embarrassing u-turn and ducked a debate with Jeremy Corbyn in the process – it will inevitably lead to questions about her suitability to conduct the Brexit negotiations that begin later this month. Given the high expectations set at the start of the campaign, a majority of around 30 could still be fatal for May. The lesson for any Prime Minister considering a snap election in the future is simple: it’s not a question of whether or not you can win a majority, but whether you can win by enough to survive the resulting term in government.